One afternoon of sewing resulted in this. It started with tailor's tacks on the darts on the front. Some people use chalk or erasable pencils. I've not found those other methods work any better than good old reliable tailor's tacks. The fabric irons very nicely. The back of it is gorgeous, too, which was a selling point when I bought it. The only real problem is its propensity to unravel. I had two choices in dealing with this, other than leaving it alone and that really wasn't a choice as eventually, the seams would unravel to the stitching. I could do what's called a "princess seam". 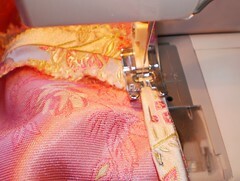 First you stitch the wrong sides together in a 1/4 inch seam. 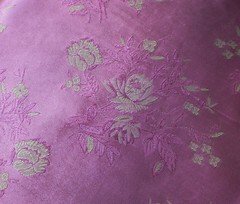 Then you fold the fabric over and stitch again the remainder of the 5/8 inch seam. It's more labor intensive but it completely encases the seam and the ends. The problem with this material is the bulk. Folding over again on the seam makes for a lot of fabric in the seam. I tried a scrap and didn't like how it looked on the outside. So, my other option was zigzag sewing the ends. I like how that worked. It's still kind of time consuming because any edge that is not a hem needs to be zigzagged. Then I go along and trim the frayed edges. 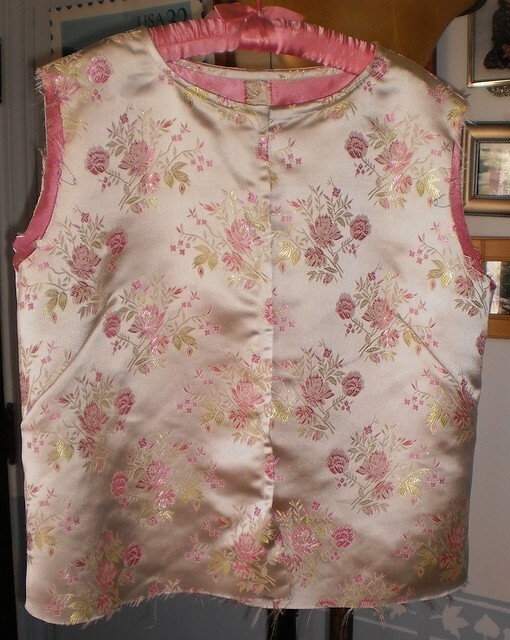 I'm very pleased with how well this sews. I had a moment of panic as I started because I couldn't remember how to wind a bobbin and I didn't have a bobbin with cream colored thread in it. 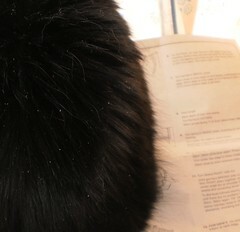 Thankfully, the instruction manual is in the sewing chest. "Oh yeah! That's right." I also had some problems with the initial zigzag attempts but discovered the top thread was just not working right. I replaced it with a lighter weight thread and have had no problems since. 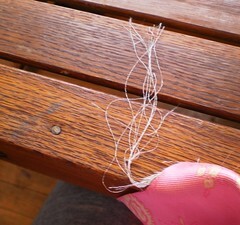 I've used up one small spool of cream colored thread and am working with a very pale pink color now. The edge stitching, shown above is cream as it's coming out of the bobbin. I even found a small spool of the green of the dress. It probably won't be enough to sew the dress with, but it might be enough to get started. For the most part, the girls hopped up on the table once, to see what I was doing and then left me alone. Pilchard tried to interrupt things but 4 kitty treats convinced her to move along. Musical accompaniment to the sewing was Joshua Bell, Voice of the Violin; John Coltrane and Johnny Hartman, John Coltrane and Johnny Hartman; Old Blind Dogs, Four on the Floor; and a classical compilation entitled Classical Cats that I've had for years. Sleeves and hem are all that are left to do. I think I need to have Pam help me with the hem to make sure it's even. I'm still unsure about the closure at the neck. I think I need to make the dress and see the whole outfit to decide what I should put there. I have it pinned shut for the photo. I have probably 2 more hours of work and it's done. I'm really pleased with how quickly it went together considering I have not sewn in a couple of years. Carole had her dress fitting on Thursday and just needs the straps adjusted. I was sent a photo but, no, I'm not posting it. Suffice it to say she looked beautiful. In less than 2 months, this whole event will be a memory. Time has passed so quickly from November when we first walked into that dress shop and she started trying on dresses.